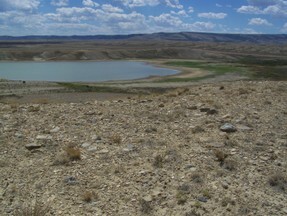 This project is a continuation of our award-winning 2014 PIT project, during which we did scaled drawings of 40 stone circles along a ridge above the Teton Reservoir Recreation Area (TRRA), approximately 15 miles south of Rawlins. A number of sites on the National Register of Historic Places (NRHP) and those eligible for placement are located adjacent to the TRRA, and include prehistoric and historic stone circles, camps, and resource processing areas. Because of the sites' proximity to the recreation area, they have become vulnerable to damage from illegal off-highway vehicle (OHV), dirt bike use, and looting. This year's project will mitigate further damage to the sites through data recovery, controlled excavation of features and their surrounds. All of the sites have been previously recorded, with preliminary work done at most. However, final recording and mapping will be part of this year's project, as will sample collection for radio carbon/AMS dating, and micro- and macro-botanical analysis. And, for those who are so inclined, there's fishing in Teton Reservoir, hiking on the nearby Continental Divide Trail, and rafting, canoeing, and world-class trout fishing on the North Platte River, 20 miles east of town. In addition, Rawlins has a museum and the old Frontier Penitentiary. So, come for the archaeology and help us protect and preserve the sites, stay for the outdoor fun the area has to offer! We hope to see you again this summer!